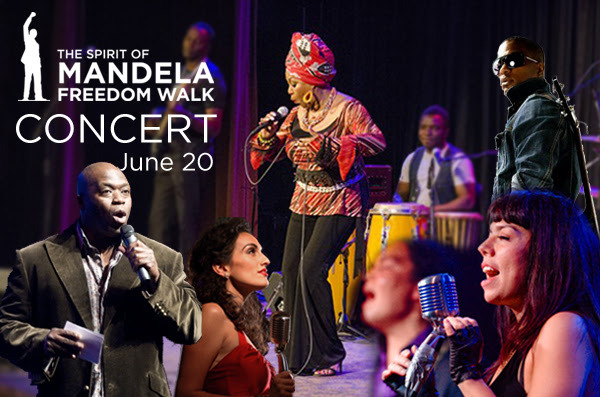 Following the Spirit of Mandela Freedom Walk on Saturday, June 20 there will be a live concert in Queen’s Park, beginning at 1:30 pm! The concert features top performers such as Digging Roots, 2010 Juno Award winner for Aboriginal Album of the Year, singer-songwriter Amanda Martinez, Lorraine Klaasen, the eclectic South African Canadian performer, hip hop artist, Najjah Calibur, and spoken-word artist, Dwayne Morgan. The Hon. Kathleen Wynne, Premier of Ontario, John Tory, Mayor of Toronto, His Excellency Membathisi Mdladlana, High Commissioner for South Africa, Hon. David Onley, former Lieutenant Governor of Ontario will bring greetings. Akua Benjamin, veteran social justice activist of Toronto will be our keynote speaker. The event emcee will be Farley Flex. There is still time to register for this event! Please register here.